As you may or may not know, most of the country is supposed to be hit by an unusual, unseasonable, very mean, no good, long-lasting cold front starting tonight/tomorrow, so today is our last nice fall day before the winter temperatures really start to bare their teeth. To fight back against that in a small (and ultimately insignificant) way, I'm posting some pictures that I took of a beautiful fall day in my backyard about a month ago, when the foliage was vibrant, the grass was soft and green, and the temperatures were nice and mild. Not "Leaves of Grass," as Walt Whitman would say, but definitely leaves AND grass, summer and fall. 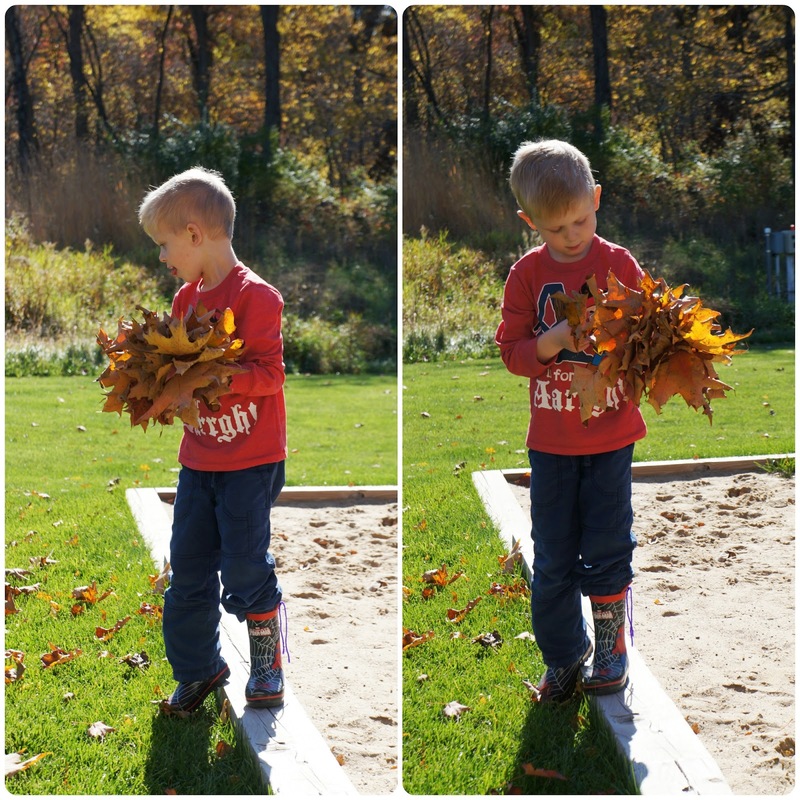 The falling and fallen leaves were big and plentiful and Sam gathered a nice big bouquet of them. This tree in the backyard is one of my favorite things in the fall. The tree provides a pretty view from inside the house too. Fall is such a beautiful gift of nature! I see what looks like a small headless ghost or apparition of some sort in this picture. I know it's probably just a play of light on the camera, but it's fun to speculate--you never know!